Hot on the heels of the Sony Xperia Z2 rumours comes some juicy information about the Japanese firm's latest slate - the Sony Xperia Tablet Z2. According to the ever reliable @evleaks we're apparently looking at a powerful tablet wrapped up in a tiny 6.4mm frame. That would make the Xperia Tablet Z2 slimmer than the svelte, 6.9mm Xperia Z Ultra and a whole 1.1mm slimmer than the 7.5mm iPad Air. Sat inside that impossibly thin frame is said to be a fairly standard 2.3GHz quad-core Snapdragon 800 processor as well as 3GB RAM and 16GB of internal storage. Thankfully microSD support is also thrown in. Sadly there is no QHD 2K resolution here, with the Z2 tab set to match the 1920 x 1200 set up of the Xperia Tablet Z. Sony will apparently carry over the Triluminos display technology found on the Z Ultra and Z1 Compact though. The cameras have also been left alone, meaning you should expect the same 8MP rear and 2MP front sensors. 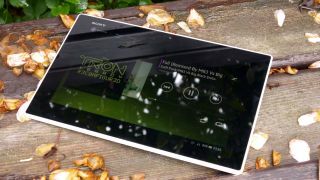 The Xperia Tablet Z2 is also tipped to sport Android 4.4 KitKat and come with a waterproof body, keeping it in line with all the current Xperia devices. A 6000mAh battery is also mentioned in the leak, which matches the power pack inside the Xperia Tablet Z. As for a Xperia Tablet Z2 release date we're still waiting to hear, though we'd be unsurprised if it broke cover at MWC 2014, a year on from the launch of the Tablet Z. We're expecting the Tablet Z2 at MWC 2014 but what other tablets might make an appearance?